A welcome treat for breakfast. I baked those loaves (there were two of them) the night before we ate them, next time I think I will retard them in the fridge after shaping so they're all fresh, warm and fluffy for a late Sunday breakfast/brunch time. Mainly because we thought that they were great right out of the oven, still warm and all fluffy. The next morning still very good, flavour less prominent and less pillowy insides. Note: I tweaked the flour/liquid ratio to suit my flour. Combine milk, sugar, butter, egg, zest, cardamom, salt and 1 cup of the flour in the bowl of your stand mixer. Stir to mix to smooth. Add 2 more cups of the flour and stir again to a smooth paste. Using a dough hook on low speed add another cup of flour and mix to incorporate, adding more of the flour as you think necessary. This is going to be a very soft dough, slightly tacky but not sticky and will clean the bowl. (It will be sticky after first bulkrise, a bit harder to shape into rolls but this makes for fluffy crumb). Turn the dough out on a floured worksurface and knead by hand, just a couple of times, keep it gentle! For bulkrise, place in an oiled container, cover and let rise until doubled. To shape; divide in small portions each weighing about 45 grams (I like my rolls to be small in monkey bread) and roll them into balls by cupping your hand over the dough and using the friction of your worksurface to make tight little rolls. It helps to oil your worksurface a tiny bit to get this slightly sticky dough get shape. Place in two loaf pans and cover to rise until puffed. When prodded with a gentle finger the dent will stay). Brush with milk/eggwash/melted butter and sprinkle with pearl sugar right before baking. Bake in a preheated oven 200C/400F, for 30-40 minutes until golden brown. Another check if they're done: slide out of your pan and pinch the edges, when they are firm your loaf is done. Adding this one to Yeastspotting over at Susan's Wild Yeast! mmmmmmm, this I like, this I like a lot. Did you bake it in that box? I have never made monkey bread before, or used dried blueberries. This loaf looks awesome! I shall put these both on my to do list..
Love your monkeybread! I'm still having a special form for it and now I can't wait using it for this bread. Wonderful breakfast treat! One question -- you mention sugar in the instructions but it's not listed in the ingredients list. How much sugar? @Lien: No, I didn't, it's a wine bottle box, I like the looks so that's why, just a prop. @Natashya: I love dried blueberries, I think it's easier to get them where you live..
@Marjoke: Oh! Is it the flower like metal ring? Nice! @Susan: Oops! You're right, it's 2 tbs. Edited and thanks! Oooh cardamom sounds so good in monkey bread. I should try baking these in loaf pans instead of rounds. Looks pretty cool that way. Just reading the list of ingredients told me this would be a lovely delight to bake and eat. (Your photo is pretty, too!) I will most definitely try my hand at baking this beauty. Your bread looks wonderful! 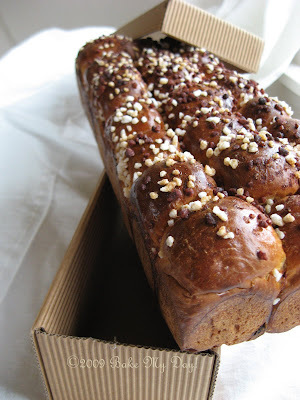 What a great idea to bake monkey bread in a regular loaf pan instead of spending money on a special pan. 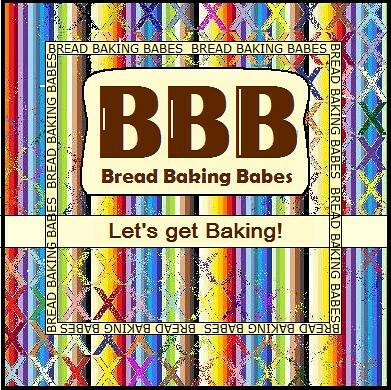 Your bread looks just as pretty as it would if baked in a tall pan! Mmmmmm, this sounds SO yummy! I will have to give it a try! I heard of this monkey bread, but never seen it as beautiful as your. Sounds pretty delicious too. Beeeeeautiful! Found you over at WildYeast. That is a gorgeous loaf. after retarding the loaves in the fridge overnight - would you put them in the oven right away or get to room temperature for one or two hours? the idea of baking fresh bread or rolls in the morning - mmmmmmmhhhhhhhmmmmmmmhhhhhhhh. I'm sure I'm missing something **really** obvious, but what do you do with the blueberries? (They're not mentioned in the recipe instructions.) Thank you. @Ted: Oops! You are right, I am so sorry! I add dried fruit to the nearly finished dough in the last couple of kneading minutes, so they stay whole. If you'd like to add fresh or frozen fruit I'd hand knead them into the dough after you finished kneading in the machine. With your hands there's a better chance of keeping the fruit as is.